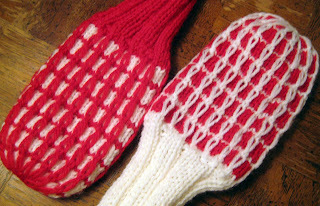 These may be for golf clubs, but they look almost like tennis racquets to me! 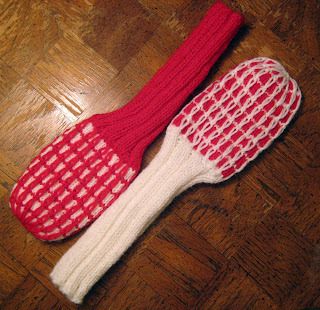 I used Lion Brand Wool Ease Yarn in White and Red and size 7 double pointed needles for the cozies. My readers will know that I loathe seaming, so I knit in the round whenever possible. After the first row, joined to knit in the round. Cuff ribbing: *k2, p3, rep from * to last st, and p.
For the body rows, on even # rows where it says purl, knit. In the second cozy, I increased the sts to 48 sts so the window pattern appears uninterrupted. Also note: A Bar increase is the same as knitting in the front and back of the same stitch. This was the first time I've seen that terminology. I always use Kfb (knit in the front and back) or pfb (purl in the front and back).